Helga’s newest book explores embroidery, and embroidering onto knitted garments and accessories. The delicate techniques used in ‘Stitches‘ add interest and depth to a simple silhouette. They can also be used to mimic intarsia and fair isle techniques, to great effect. 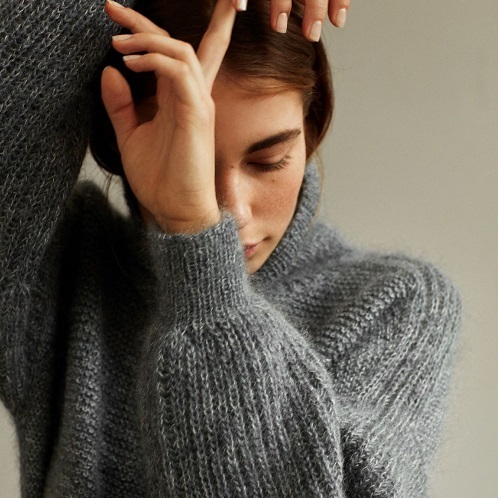 The pieces in this new book are classic and understated, with some wonderful playful elements – how fun is the DIY jumper? We love it! These designs are classical Isager. Isager designs generally use more than one yarn at once. All the projects in ‘Stitches‘ use Isager yarns held double to create wonderful textures, and amazingly dynamic fabrics. The technique of holding yarns double also means there are endless colour combinations and possibilities – it’s almost like mixing colours from a paint palette! Loop stocks almost all of Isager’s yarns, and we have great stock of the main yarns uses in ‘Stitches’ at the moment. The Spinni, Bomulin, Tweed, Alpaca 1 and Silk Mohair all feature in several different projects in the book. The ‘Chilly’ cardigan – this uses a dark green mohair and a pale grey cotton/linen, a great example of colour mixing with yarns! We can’t believe how popular this book has already been! We have just received a big delivery of more copies of the book, so you can now order copies to be sent out to you, and you can also find it in our London store. Loop has two different kits from the book – one for the Snowy scarf, and one for the Cloudy blouse. We have Snowy available now, it is currently in stock! Cloudy is sold out for the time being, but we expect to have more kits of this by next week. Feel free to send us an email if you would like to be notified when we have some more. Helga’s wonderful new book has got us thinking about embroidery – it opens so many new creative possibilities! We have lots of wonderful embroidery threads, which could be used to replace or substitute the threads that are used in the book. ‘Stitches’ mainly uses very fine cotton/linen and wool blends to achieve delicate stitches. Our Sajou threads from France are perfect for this sort of project. They come in small quantities, and we have a wide selection of colours. These would be perfect if you’d like a pop of colour, instead of the more subtle effect that Helga uses in the book. We have the Temaricious threads from Japan, and the Mehlsen from Denmark, if you’d like to use something that has been dyed naturally. Our Temaricious threads are cotton, and there’s even two Loop exclusive colour ways – Islington and Indigo Blue. 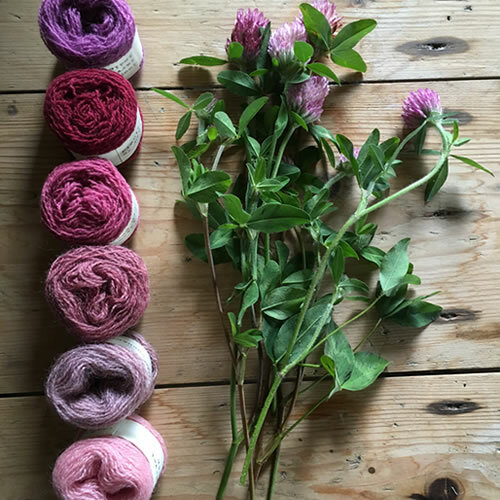 The Mehlsen yarn is very delicate cobweb weight lambswool, and comes in perfect tiny cakes. Loop also now stocks a wide range of embroidery and darning needles. We have several specialist embroidery needle sets, as well as darning needle sets and needle threaders too! And look out for the wonderful workshops we schedule throughout the year with people working with knit and embroidered stitches such as Celia Pym, Hikaru Noguchi and Helga herself who might visit us in the Autumn. We also think the Cohana mini snips would be an indispensable tool for working on your projects from ‘Stitches’. They are just 4cm long, and so are perfect for delicate, more fiddly work, as well as snipping ends and stray threads. Happy knitting and Stitching from all of us at Loop!